Bethel, New York is the original site of the 1969 Woodstock concert. The name came from the promoters using the name Woodstock Ventures, in honor of the town a good one and a half hours away in Ulster County. The town of Woodstock had been a mecca to artist from the early 20th century. In the sixties Bob Dylan, the Band, Jimi Hendrix, Janis Joplin, John Sebastian & Paul Butterfield all called the quaint town home at some point. There was no room there for the large concert, so a spot in the town of Walkill was chosen. The town threatened and forced the promoters out. Max Yasgur who owned a large dairy farm in the Town of Bethel in Sullivan County, offered his proper ty which was in the shape of a natural amphitheater. They built it, they came, the rest is history. Anyone who's ever been to the small town knows what a mind blower it must have been to have 500,000 plus people descend on the area. Pictures & film doesn't not do it justice. After many years of neglect, ideas & controversy, Bethel Woods was built on the site. Bethel Woods is an absolutely beautifully landscaped amphitheater just to the rear of the original site. I saw Chicago & America there two years ago, and its perfect for a summer concert in Upstate in New York. Concerts are held throughout the summer. It took time but now a museum called The Museum at Bethel Woods is also opened on the site. The Museum is small but really a nice place to visit. It is a celebration of both the Woodstock concert & the events of the sixties. 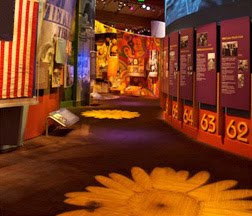 The timeline includes, baby boomers, the space age, the cold war, civil rights, pop culture, television, the counter cu lture, and of course Woodstock. The exhibits include events leading up to the concert, short films on the event, interactive productions, artifacts & personal memories of attendees. There is also a 21 minute movie called Woodstock: The Movie in the small comfy theater, with great sound & a large screen. All exhibits are self guided so you can enjoy at your own pace. 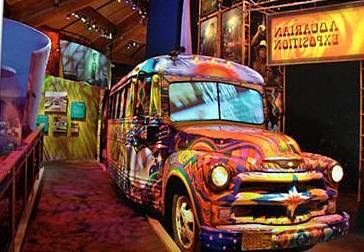 There is an old school bus painted in psychedelic colors with rows of seats, that you can sit in to watch a short film on how people got to the Woodstock concert. There is small cafe, a small gift shop and your admission price also gives you access to walk the grounds outside. There is a mini Roman style amphitheater directly outside the museum for small events. Y ou can walk directly over to the actual field the concert was held on. I was there for the 1998 Day In The Garden Concert, and a few other times since. No matter how often I go & walk on that site I get chills, it's like sacred Rock & Roll ground, a must for fans to experience. At the bottom of the field on the corner of Hurd Rd. & West Shore Dr. there is the stone monument which was erected by a sculptor & his wife in the 1980's. The marker is painted with the concert logo & names of the acts who played. There is a table with a couple of chairs set up so you can hang out a while. Believe me there are always people stopping by there to chat with. Last time I got lucky to meet local historian Duke at the marker & had a long chat with him. In addition to concerts at Bethel Woods, the museum holds smaller events like private functions & lectures. There is plenty of free parking on the beautiful grounds. The price of admission is $13 per person, & no photography is allowed inside. centerfield maz highly recommends music fans to make a nice day out of it at Bethel Woods, located off Route 17B at Hurd Road in Bethel, New York.